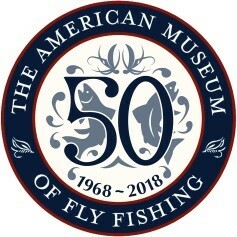 To mark the celebration of their 50th anniversary, The American Museum of Fly Fishing will hold a dinner and auction at the Racquet & Tennis Club in New York City on May 3, 2018. Manchester, Vermont (April 5, 2018) – The American Museum of Fly Fishing will celebrate its 50th Anniversary with a Dinner & Auction at the Racquet & Tennis Club in New York City on May 3, 2018. Luminaries from the fly fishing world who will be sharing their thoughts on this auspicious occasion include: author and publisher Nick Lyons; acclaimed traveling angler, filmmaker and AMFF Ambassador Rebekka Redd; and the “first lady of fly fishing,” Joan Wulff. Artist, writer and naturalist James Prosek will be on hand as Master of Ceremonies. A special pre-dinner reception will be hosted by former Secretary of the Treasury Paul Volcker and his wife, Anke. Guests will have the opportunity to bid on a wide variety of live and silent auction items, donated by AMFF supporters within the fly fishing industry and beyond. Live auction items, under the expert hammer of Heritage Auction’s Nick Dawes, include a beautiful H.L. Leonard Rod from the early 1970’s, as well as angling getaways across the U.S. and Canada. The historical home of fly fishing, AMFF was established in 1968 by a group of avid anglers inspired by Herman Kessler’s discovery while researching an article for Field and Stream Magazine. In the attic of Orvis, he found panels dating back to 1893, created by Mary Orvis Marbury as a showcase for her father’s eponymous store. These became the foundation of The American Museum of Fly Fishing’s collection, which now contains 22,000 flies, 1,300 rods, and 1,300 reels, the majority of which were received as donations over the past 50 years. AMFF also publishes a quarterly award-winning journal, The American Fly Fisher, and houses an extensive assembly of angling books, including Arnold Gingrich’s copy of Izaak Walton’s Compleat Angler. Printed in 1759, it is the oldest book in the Museum’s Gardner L. Grant Library. Gingrich was one of the founding trustees and served as Museum President from 1974 – 1976. Tickets for the event are available at amff.org. Please contact Samantha Pitcher 802.362.3300 for further information.